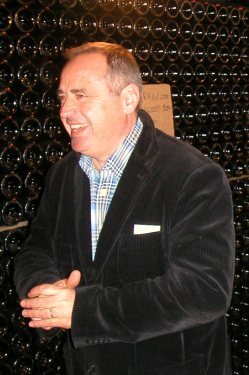 Claude Giraud has vineyards in the district of Aÿ, and produces two labels: Champagne Francois Hemart and Champagne Henri Giraud. Francois Hemart is a non-vintage range, with all fruit coming from Grand Cru villages in Aÿ, whilst wines under the Giraud label are only released as vintage wines, again with all fruit from the best vineyard sites in Aÿ. The vintage wine sells for upwards of 100 euros per bottle, putting it slap-bang in prestige cuvée territory. Claude tells me that Aÿ is known for low acidity, on average yielding only around 4gm/l of total acidity. Yet despite this, Claude’s wines do go through malolactic, and he harvests late. He pays great attention to the ‘natural balance’ of the harvest, and finds that carefully managed S02 levels are one of the keys to the ageability of his wines. In Champagne there are around 150 houses that vinify in wooden barrels. Claude started to use barrels in the early 80s, after researching how Champagne was made in previous centuries. He found that the local Forest of Argonne had been the source of much of the village’s wood, but the forest having not been managed for decades, he bought 2nd hand Vosges barrels from Meursault. Now, Claude has worked with other growers in the village and has managed to revive a barrel industry in the Argonne Forest, and is proud of these barrels in his cellars. 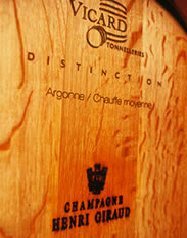 The Henri Giraud wines spend 12 months in wood. He explains that his 10 hectares of vineyard is on a south-facing slopes with only 20cm of topsoil on 200 metres of chalk. His youngest vineyard is 30 years old, and he farms with minimum use of chemicals. He believes the reason he can make a vintage every year is because of the quality of his vineyards, and the care he takes of them. Certainly a tasting of Vin Clair from oak was extraordinary: a round, full Chardonnay of 12% ABV, as rich and mouthfilling as a white Burgundy. See current stockists of Henri Giraud on wine-searcher. Briefly, Giraud’s non-vintage is worth a mention as it is a terrific Champagne with fat, lemony fruit and real structure, whilst the two vintages tasted showed the ripeness and richness of Giraud’s vineyards and his use of oak. 70% Pinot Noir, 30% Chardonnay. Quite a bold lemony colour with green reflections. Very fine nose, with just little lime zest notes and almost tropical hints of waxy citrus fruit and some ripe cherry nuances. There are hints of dried apricot in a subtle, stylish nose. In the mouth the mousse is quite fine and races across the tongue, with very crisp fruit – lots of lemon and lime that is zesty and racy. There’s breadth and a mouthfilling weight, but it stays very focused and structured. 91. Darker, burnished golden colour. More mature, truffle and undergrowth notes with a toffeed element and quite ripe, cabbagy notes not unlike a ripe white Burgundy. Low carbonation, with a gentley prickly mousse, and again a very nicely lively palate. Racy orange notes, and loads of zippy lemon fruit and acidity. Lovely boiled sweet edges of sour plum and green apple, and fine length here. Just a hint of sweet fruited and buttery richness, but stays razor sharp in the finish. Very fine. 93. Eric and Isabelle Coulon run a successful and sizeable business. Their annual production of 90,000 bottles compares to an annual production at a house like Pol Roger of 1.5 million bottles. At their immaculate cellars in the village of Vrigny, Rogers shows me a map of his vineyards, with nine hectares spread across five different villages. Around 40% of his plantings are of Pinot Meunier and he is fiercely ready to defend this variety, which he says is more than capable of the highest quality, especially with his old vines (average age of 38 years). His is a massal selection, with no ‘clones’ used, which he insists preserves a character for these wines that his been in his family for eight generations. Like Claude Giraud, the Coulon’s practice Lutte Raisonée, ‘reasoned agriculture’, where minimal herbicides and pesticides are used, and instead techniques like ‘sexual confusion’ are employed to limit the breeding of pests. Eric Coulon also uses only wild yeasts in fermentation, which he says “bring to the wine all their subtlety, allowing the soil to ‘express’ itself.” Wooden barrels are also used to age some of reserve wines. 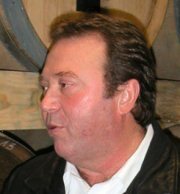 Coulon’s wines are very much like the man: he is an exuberant and passionate character, who opens each bottle with a ferocious pop, and pours each glass with gusto. The wines are vivacious and lively. This is a fine NV, somewhat in the rich, brioche style of Gosset’s Grand Reserve, though sharing the fruity and direct character of the vintage wines, it lacks the quite steely character at their core. At time of writing it is the 2000 that is on sale. This wine will be shipped in Spring 2008, and is not yet disgorged. It is a blanc de noirs, made with 50% each of Pinot Meunier and Pinot Noir, the Pinot Meunier almost 60 years old. Exuberantly bubbly, with a powerful stream of tiny bubbles streaming through a light golden wine, flecked with emerald green. Fine vinous nose, with lemony notes and a small biscuity background. Some spice and herbal nuances add interest. On the palate it is very fruity, with small nuances of luscious, almost tropical pineapple fruit playing against a lemony, firm, pithy acidity. This is a hugely vivacious wine, with plenty of racy elegance. 91. 80% Chardonnay with 20% Pinot Meunier. Bold golden yellow colour. As always with this house, exuberantly bubbly. He chardonnay performed very well this year, whilst the Pinot Meunier was unexceptional. A touch of buttery vegetal quality on the nose here, with really quite lush fruit. There’s a touch of rotted orange and rancid butter that gives quite complex notes to this wine. In the mouth it is quite rich and full, still with a very lively, racy mousse, but with that slightly sour apple and sour orangy fruit quality. This is a less linear, focused style perhaps, but has plenty of mouthfilling fruit and good balance. 90. 80% Chardonnay with 20% Pinot Meunier. Very pale lemony gold colour – paler than the 2000 at this stage. Very appealing, vinous nose, with a vanilla and ripe orchard fruit character, and no sign of any oxidation or yeasty notes. A very clean style of wine, which at this stage is tight and a touch closed. On the palate the mousse is quite crisp and a touch aggressive (but this was served slightly too cold). Fine, tight, very steely character to this wine, with plenty of lemony fruit. There’s a sherbetty brightness to this wine, and the acidity is terrifically vibrant, but I feel the too cold serving temperature is making it feel rather too aggressive in this tasting. Pale to medium gold colour. Lovely nose, with gentle yeastiness and notes of spices and coffee coming through. Biscuity, with some vanilla and little floral scents. Plenty of fruit, with peach down and still some lemony freshness. On the palate the generosity fills out, with a very racy, steely character. Crisp mousse, terrific fruit here, and the maturity really allows charm and fullness to come through that for me complements the firm structured, very steely character. Served from Magnum. 90. Pol Roger is one of the best-loved names in Champagne. The house has had a long and particular association with the UK, perhaps immortalised by Sir Winston Churchill, who was a life-long devotee of the house. I met with Pol Roger’s charming and welcoming Chief Executive Patrice Noyelle, who has steered this house since 1997 along with Christian Pol Roger and Hubert de Billy of the owning families. Patrice spent many years running the house of Mommessin in Burgundy, and he sees his job as blending the best of Pol Roger’s illustrious past, with a more modern thinking. This extends from a subtle but telling re-working of Pol Roger’s packaging, to the massive investment in technology in the cellars. Pol Roger remains a family house, owned jointly by the Pol Roger and de Billy families, and is of a moderate size, producing around 1.5 million bottles annually. Their cellars in Epernay are a wonderful labyrinth of slumbering bottles stretching under the city streets, yet up above the 19th century buildings contain a gleaming array of purpose-built tanks and vinification technology that speaks of recent, and considerable investment. Amongst other innovations is a brand new wine, Pol Roger zero dosage cuvée. From the annual production of 1.5 million bottles, 300,000 are vintage wines: Pol Roger Vintage, Chardonnay Vintage, Rosé Vintage and Cuvée Winston Churchill. Patrice Noyelle says they plan to double production of the latter wine if, but only if, quality can be maintained. I’m sure it is not only Patrice’s Burgundian sensibilities that make this house so committed to vintage wines, nor so committed to terroir, the house owning 50% of its vineyard requirements. These wines – and perhaps particularly the Chardonnay Blanc des Blancs – are clearly conceived as fine wines, to be laid down until ready, and it was on these wines that my tasting was concentrated. 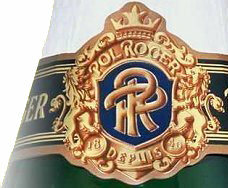 See current stockists of Pol Roger Vintage Chardonnay on wine-searcher. Still has a brilliant green tinge to its yellow colour. Still a steady but small stream of miniscule bubbles. Very nicely maturing nose, with a lovely toffeed note beginning to emerge. Very fine apple and pear fruit here, with plenty of ripeness and a herbal tinge to the fruit. Gorgeous palate, with plenty of fruit that is sample and generous, but as is characteristic here, all constrained and made elegant by pinpoint acidity that runs like a steel core through this wine. Perhaps lacks the ultimate complexity of the 1990, but delightful and has more time yet. 93/94. Still a green colour to a deepening yellow/gold. Very small bubbles, gently effervescing. An almost Riesling like waxy lime leaf and lemon rind quality, and a mineral smoky note. A little caramel and nutty note comes through. On the palate again there is a little suggestion of Riesling, with that waxiness coming through. The mousse is very gentle, with a seamless quality, leading to a plump, full, fantastically opulent and rich wine that is extraordinarily vinous. 94. What an extraordinary opportunity this was, to taste a wine that, according to Patrice was “Harvested to the sound of cannon fire, but drunk to the sound of victory trumpets.” This is not a Blanc des Blancs, but a 50/50 blend of Pinot Noir and Chardonnay. Deep, rich golden colour, slightly hazy, with perhaps a tiny effervescent still discernable. The nose has a fabulously rich opulence, with honey and buttery mint aromas, and a sherried background showing some toffee and nuttiness and touch of wild mushroom. On the palate it is oily and buttery in texture, with plenty of sweetness (this may well have been a rich style), with little notes of Cognac and nuts, and a lovely freshness still. There is still harmony here, with really quite a pure character into the finish, perhaps just showing a little oxidised edge. What a brilliant experience to taste this wine. 95. My previous meetings with representatives of the house of Krug had been with Rémi Krug, and never his brother Henri. The urbane Rémi was always the more natural ambassador and front man for the house, whilst winemaker Henri stayed firmly in the background. Now, well into their sixties, both have taken a back seat and I was greeted in Krug’s business-like offices in Reims by Henri’s son Olivier, who has taken over the reins as head of this house.Olivier, who has recently turned 40, bounds into the room and leaps (elegantly) over a couple of low tables to reach the water that had been left on the sideboard by an assistant moments before. Clearly this is an athletic and youthful new broom in the corridors of Krug power. Olivier Krug tells me that he is the “old man” of the senior team at Krug: most are in their thirties. Olivier has worked in the family business for 17 years, including a two-year stint as Krug’s man in Japan, a language he speaks fluently. Now his duties include Director of Production, as well as being in charge of relationships with Krug’s family of growers, a job which he says is his “main challenge,” as access to the highest quality fruit becomes increasingly competitive. Olivier’s father and uncle still sit on the tasting committee, as the Krug family has always done, responsible for blending decisions. Although he knows my visit has a specific vintage focus, Olivier stresses that Krug’s NV Grande Cuvée is the essence of Krug, with the current disgorgement featuring reserve wines stretching back to 1990. Indeed, the release of a vintage-dated Krug is still comparatively rare, the current vintage on the market being the 1995 and the one before that, 1990. Olivier says “Krug releases a vintage not just when the year is very good, but when it is ‘exceptional’ or ‘different’. There was no Krug 1983, ’86 or ’93 for example: all very good years, but not ‘unique enough’ for Krug. Krug’s ‘no rules’ policy on vineyards and blends is of course the antitheses of a many grower-houses, where the same plots of land are responsible for each vintage. But this array of beautiful wines does say something about the year, like the remarkable trio of 1998 – 1990. But it perhaps says more about a recognisable ‘house style’, which I guess is the most crucial aspect for Krug. Quite a medium-deep, burnished gold colour. Very tiny bubbles still rising intermittently. Clearly some age here (served blind). Fabulous old Champagne nose. Wonderful waxy parcel string and old brown paper notes. Terrifically nutty, with walnut and hazelnut, chestnut puree notes. Coffee and chocolaty notes really start to build. At the core still something of a fat lemony, waxy character. On the palate an immediate burst of fruit sweetness. The palate is beautifully harmonious, with gorgeous roundness of fruit, that broad coffee and nutty spice background. There is a beautifully rounded but bright orangy acidity with a real mandarin orange note and lots of finesse here. Similar to the 1982 in some ways, but has a little plumpness and comfortable, settled character of fruit yet still marvellous freshness. A beautiful wine and wine experience. 94.